This sweater is still on-going. The head is all that is left. I hope to finish it this weekend. Poor kid has been waiting for over a year for this sweater, and although we keep having some colder days, spring is on its way. I hope that it will be big enough to last next winter as well. 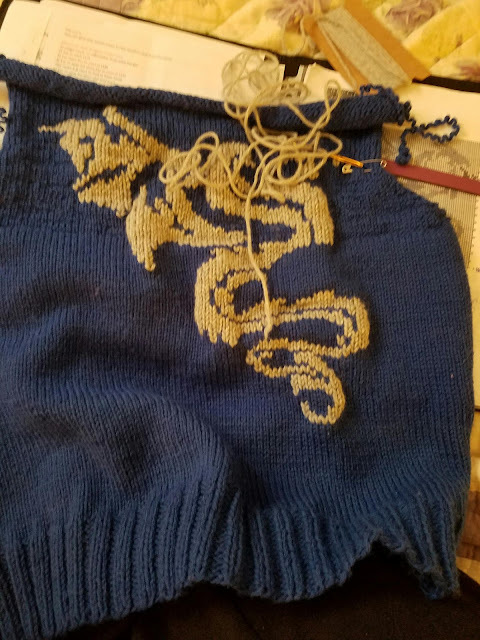 I have honestly been off and on with this sweater. It just takes so much concentration, it is hard to work on during the day. I have plans for after all Little Man's stuff. I am working on the Master Crocheter's program, and I think I plan on something for me. I have a couple of ideas, and some projects waiting for myself. So far, it is turning into an interesting year.